The National Botanic Garden of Namibia is a 12 hectare nature reserve in the heart of the City of Windhoek, where you can see and learn about Namibia's fascinating plants. Note that the National Botanic Garden is CLOSED AT WEEKENDS AND PUBLIC HOLIDAYS, except for the second Saturday of every month when it is open from 08:00 to 11:00. The National Botanic Garden of Namibia strives to protect and promote the sustainable utilisation of the Namibian flora and to function as an educational and recreational nature facility for Namibians and visitors alike. Monday to Friday, from 8h00 until 17h00 and every second Saturday of the month from 8:00 to 11:00. Entrance is free, except on weekends. Guided walks for school groups and students are available on request, but must be booked well in advance. The land was donated to the Government by the City Council of Windhoek in October 1969, and was originally earmarked as a nature reserve. 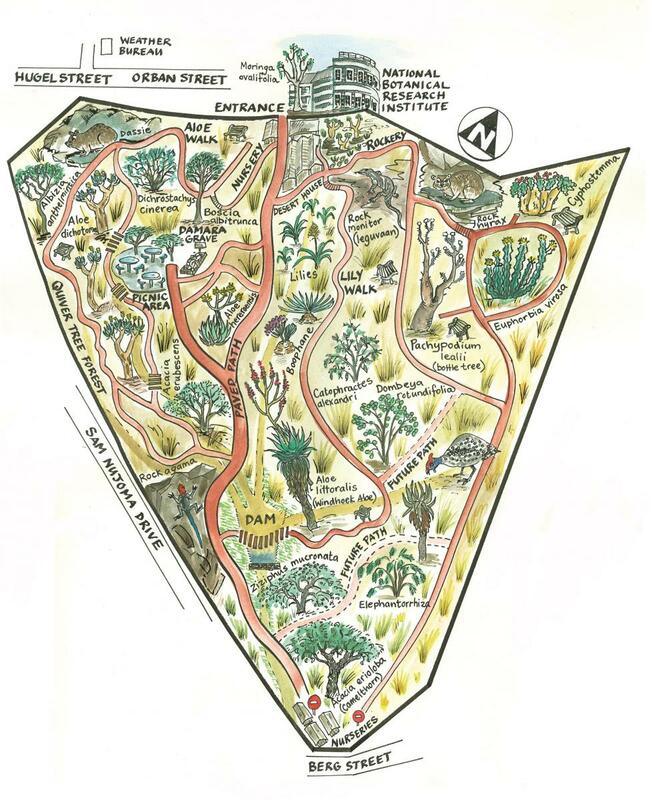 Initial development started in the early 1970s with the construction of walking trails, a stormwater system and a dam. Unfortunately, due to a lack of funds, the then Department of Nature Conservation had to terminate all development activities and the garden was abandoned. When the National Botanical Research Institute (NBRI) moved to the buildings adjacent to the reserve in 1990, the idea was born to develop the area as a Botanic Garden. Negotiations were initiated between the Ministry of Environment and Tourism and the Ministry of Agriculture, Water and Forestry (MAWF), and in February 1993 the NBRI obtained the right to develop the land into a Botanic Garden. The garden depends on funds from the MAWF for its maintenance and development. However, in recent years it has additionally been supported by the Botanical Society of Namibia. The National Botanic Garden of Namibia strives to protect and promote the Namibian flora and to function as an educational and recreational facility for Namibians and visitors alike. It is the only one of its kind in the country and focuses exclusively on Namibian plants. Unlike many other botanical gardens, the larger part of the garden has not been landscaped. The reason for this is 1) to conserve water and 2) to emphasise plants in their natural environment, thus allowing students and visitors to learn more about the vegetation around Windhoek, known as highland savanna. However, several special displays ensure that visitors also get to see plants from other parts of the country, such as the Desert House display on the Namib Desert or the Kunene Region. To serve as a tourist attraction and recreational area. A number of self guided walking trails lead through the garden. The most common woody plants are labelled and bird and plant lists are available at Reception. The garden boasts one of the densest stands of the Windhoek Aloe (Aloe littoralis), the symbol of the city of Windhoek. The quiver tree forest and bottle trees too, are well worth a visit. They were planted here in the early 1970s and are of exceptional size and beauty. Early in the year, after good rains, you can admire some of our lilies flowering along the Lily Walk. Be sure to visit the Desert House, where some fascinating plants from the Namib Desert are displayed. The garden also is home to a variety of mammals, birds, reptiles and insects. Bring along your binoculars and field-guides and do some bird-watching or dassie-spotting. The picnic area provides the perfect spot to end your visit. Enjoy some cooldrinks and snacks (which you need to bring along) whilst you relax in the tranquil atmosphere of the garden. Volunteers for the Garden tour guide group. The removal, damaging or collecting of any plants or plant material such as seeds is strictly prohibited. Approach all wildlife in a respectful manner. The elderly taking part in the guided garden walks in the Botanic Garden.